In November 1998, Wolfgang Müller, founder of „Die Tödliche Doris“, decided to re-release the band’s sought-after and long unavailable first vinyl LP. However, not as sound, but as a gesture: Sign language interpreters Dina Tabbert and Andrea Schulz translated and reshaped the lyrics and music of “ ” using nothing but signs and gestures. The result of this transmutation is a ‘soundless’ music, expressed entirely within and through the body, gestures, movements, interaction and facial expressions. In November 1998, many hearing-impaired people – and an equal amount of those who could hear just fine - made their way to the Prater der Berliner Volksbühne to witness this process as part of a series of events called ‘Gehörlose Musik’ (music for the deaf or ‘soundless music’), initiated by “Freunde guter Musik” (friends of good music). Now this DVD brings the music of this legendary, long unavailable LP from 1981 back to life – in the guise of gestures, signs, interaction and movement. And the result is no dance, no performance, no music – it constitutes a new form of art defying conventional definition. Besides its main feature, this hand-numbered DVD (available in a limited edition of 1000) also contains an interview with Wolfgang Müller of “Die Tödliche Doris” as well as a 48-pages book with writing and photographs. MONITORPOP launches a new DVD label: EDITION KRÖTHENHAYN©. 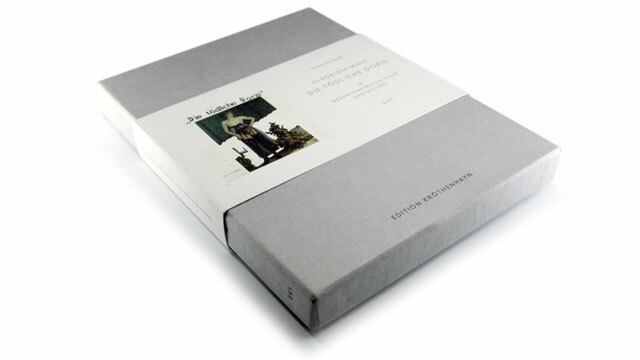 High quality hand-numbered editions featuring contemporary art for which the DVD format is the convenient outlet: artists from the various branches of actionism / performance and visual art / art film portrayed on DVD. Bonus features like interviews and documentaries to respective artists and actions give an impression of context and intentions. The packaging consists of a slip lid box with banderole, containing a DVD plus booklet or book with photos and texts.